Picadillo is a traditional South American dish, usually made with ground beef, tomatoes, olives and raisins, and lots of herbs and spices. I decided to make it in my slow cooker, using chicken thighs instead of ground beef. It turned out so delicious, I had to share! To stick with the same flavors, I served it with Cilantro Lime Quinoa. I often hear from friends that quinoa is so bland. Well, it is bland, when cooked by itself in water. The trick to a tasty quinoa is simmering it in chicken or vegetable stock, along with herbs and spices. 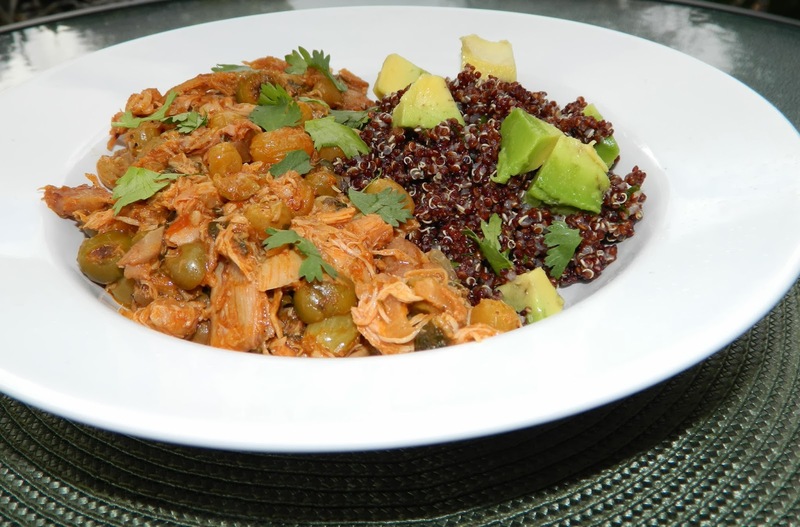 In a Crock-Pot or slow cooker, combine all ingredients except for the raisins. Stir, cover and set on High. Let cook for 4 hours. Remove lid and stir in raisins. Cover and cook for 1 more hour. Shred chicken with two forks. 1. In a medium pot, combine quinoa and chicken broth. Bring to a boil over medium heat. Reduce heat and cover. Let simmer until quinoa is tender and liquid is absorbed, about 15 minutes. Stir in cilantro, lime juice, garlic and remove from heat. Season with salt and pepper to taste. Cover and let stand for 5 minutes. 2. Dice avocado and serve on top of quinoa. Sprinkle with remaining cilantro.